At the invitation of Wolfgang Ischinger, Chairman of the Munich Security Conference, Yang Jiechi, Member of the Political Bureau of the CPC Central Committee and Director of the Office of the Foreign Affairs Commission of the CPC Central Committee, will travel to Germany for the 55th Munich Security Conference from February 15 to 17. The Munich Security Conference is an important forum on international security policy. Director Yang Jiechi will deliver a keynote speech at the conference and elaborate on China's views and proposals on major issues such as the current international situation, multilateralism and international cooperation. Director Yang will also hold bilateral meetings with relevant senior officials attending the conference to strengthen communication and exchange with various sides. Q: As we can see, there are more foreign leaders sending congratulatory messages for China's Lunar New Year than that in the previous year. The Russian Prime Minister Medvedev specifically visited the Chinese Embassy in Russia to mark this traditional festival. A number of world leaders including President Trump of the US, President Duterte of the Philippines, Prime Minister May of the UK, Prime Minister Abe of Japan, Prime Minister Morrison of Australia and Prime Minister Ardern of New Zealand extended Spring Festival greetings to the Chinese people in various ways. What is your comment? A: In China all families get together on Spring Festival as it is the most important, ceremonious and joyous of all traditional festivals for the Chinese. It symbolizes how much we cherish our family and aspire for a harmonious and prosperous life. During the Spring Festival, Prime Minister Medvedev visited the Chinese Embassy in Russia and extended best wishes to the Chinese people. This fully demonstrates the high-level and unique nature of China-Russia comprehensive strategic partnership of coordination, and the deep friendship between our two countries and peoples. It marks a good start for this year's celebration of the 70th anniversary of China-Russia diplomatic ties. We believe that with joint efforts from both sides, our comprehensive strategic partnership of coordination will be brought to a new height. As you said, during this Spring Festival, many foreign leaders extended congratulatory greetings and best wishes to the Chinese people, and delivered positive remarks on the important contributions made by Chinese communities to local economic and social development. I think it reflects not only the influence of traditional Chinese culture, but also other countries' recognition of traditional Chinese culture and ideals and their readiness to further friendly exchange and cooperation with China. As the traditional Chinese proverb goes, "harmony in the family brings prosperity." When the family members live in harmony, they can do everything smoothly. I think this philosophy also applies to state-to-state relations. If countries can share mutual respect, seek common ground while reserving differences and co-exist in harmony, the world will enjoy peace, development and prosperity. It meets the common aspiration of all people and serves the interests of all countries. In the year ahead, China will continue to work with all countries to build a better, more harmonious, prosperous and peaceful world. Q: On February 9, the Spokesperson of the Ministry of Foreign Affairs of Turkey criticized China on the situation in Xinjiang and its relevant policies. What is your response? A: I have noted these very bad remarks made by the Spokesperson of the Ministry of Foreign Affairs of Turkey. The Chinese Embassy in Turkey has already made a response at the earliest time possible, and the Chinese side has made stern representations with the Turkish side. Before saying anything else, I want to draw your attention to a fact. The Spokesperson of the Turkish Foreign Ministry claimed that "the distinguished folk poet Abdurehim Heyit passed away in his second year of imprisonment". However, the fact is that he is still alive and in good health. I saw videos online yesterday that testify to that. The Turkish side is extremely mistaken and irresponsible in making groundless accusations against China just based on some ridiculous lies that declare a living person dead. We are strongly opposed to that. First, since 1990s, the "three evil forces" (terrorism, extremism and separatism) in China and abroad have plotted, organized and conducted thousands of violent terrorist attacks in Xinjiang, injuring and killing a great number of innocent people of various ethnic groups. Drawing on the anti-terrorism experience of the international community and based on its realities, the Chinese government has been actively working to counter terrorism and extremism and made notable achievements. People in Xinjiang now have a stronger sense of security, happiness and fulfillment. Recently, diplomatic envoys and representatives from a dozen countries as well as media representatives from countries including Turkey visited Xinjiang. They toured a lot of places, including vocational education and training centers. Their trip enhanced their comprehensive understanding of the economic and social situation in Xinjiang, and they believed that the radiant smile on the faces of local people is the most eloquent response to those rumors. One media representative from Turkey said after the trip that "I clearly saw that China has rolled out and implemented targeted measures in combating terrorism and extremism. They are a series of complementing measures to counter terrorism, accelerate economic development, improve people's livelihood and strengthen education in Xinjiang. Such a strategy is very wise and deserves to be learned by Turkey and the whole world." Second, people of all ethnic groups in Xinjiang enjoy full freedom of religious belief in accordance with the law. Xinjiang now has 25,000 venues for religious activities, including mosques, churches and temples. Among these, there are 24,400 mosques and eight religious institutes. Xinjiang has a population of 24.4 million people, among which 13 million are Muslims. That means, on average, 530 Muslims share one mosque. According to available data, Turkey has a population of 82 million people and 90,000 mosques. That means, on average, 910 people in Turkey share one mosque. Third, people of all ethnic groups in Xinjiang have the right to use their own spoken and written languages in accordance with the law. The Constitution and the Law on Regional Ethnic Autonomy stipulate that various ethnic groups have the freedom to use their own spoken and written languages. Spoken and written languages of ethnic minorities are extensively used in press & publishing and radio & television. College entrance examination in Xinjiang is available in five languages, including Chinese, Uygur and Kazak. Fourth, the cultural rights of people of all ethnic groups in Xinjiang are legally guaranteed and fully respected. 109 religious historical and cultural sites including Kashgar's Id Kah Mosque are listed as Major Historical and Cultural Sites Protected at the National Level. Currently, on the UNESCO Representative List of the Intangible Cultural Heritage of Humanity are the Art of Xinjiang Uygur Muqam and the Kirgiz Epic of Manas. Facts speak louder than anything. I believe that for all those who harbor no prejudice nor malicious intentions, they will feel genuinely happy for the solidarity, closeness and harmony enjoyed by the 56 ethnic groups in China. They will not make hostile accusations by fabricating lies. At last, I want to say that Turkey is also a multi-ethnic country facing the threats posed by terrorism. If it adopts double standards on counter-terrorism, it will only end up hurting itself as well as others. We hope that the Turkish side could make unbiased and impartial judgments, correctly view and understand the relevant policies and efforts made by the Chinese side and take concrete actions to promote mutual trust and cooperation between China and Turkey. Q: According to reports, during the Dialogue on the Implementation of China-Africa Peace and Security Initiative held on February 6th in Addis Ababa, the capital of Ethiopia, African delegates spoke highly of the historic significance of the FOCAC Beijing Summit and welcomed China's major approach to the implementation of the China-Africa peace and security initiative. Can you give us more information on this? A: The Chinese side has issued a press release on the Dialogue on the Implementation of China-Africa Peace and Security Initiative. During the successful FOCAC Beijing Summit in September 2018, the Chinese side and the African side agreed to join hands in building a closer China-Africa community with a shared future. President Xi announced a series of new approaches to strengthen China-Africa cooperation on peace and security, and leaders of the two sides reached important consensus on the joint implementation of relevant initiatives, making it an important part of the eight major initiatives of the Beijing Summit. This year is the first year to implement the outcomes of the Beijing Summit. The dialogue in Addis Ababa on February 6 is an innovative event to enhance China-Africa cooperation on peace and security. During the dialogue, the two sides complemented each other's thoughts and actions, made proposals for implementation, and created more momentum and synergy for future cooperation. The two sides deepened communication and dialogue on the peace and security situation in Africa and better complemented each other's policies and actions. In a nutshell, it was a successful meeting that reached its targeted goals. China has all along been honoring its obligations as a permanent member of the UN Security Council, following the principle of sincerity, real results, amity and good faith and the principle of pursuing the greater good and shared interests proposed by President Xi, and actively participating in Africa's peace and security affairs. No matter how the international situation may evolve, China's resolves won't change: it will earnestly implement the new cooperation initiatives announced by President Xi during the Beijing Summit and the important consensus reached by leaders of both sides. The Chinese side is ready to work with the African side to implement the outcomes of the Beijing Summit, see to it that the Belt and Road Initiative and the AU Agenda 2063 better complement each other, jointly promote multilateralism, strengthen the multilateral system, uphold the interests of China, Africa and all developing countries, so as to make contributions to peace and stability of Africa and the world. Q: It has been reported that on February 11, two US warships, USS Spruance and USS Preble sailed within 12 nautical miles of relevant islands and reefs in the Spratly Islands. I wonder if you have any comment on that action? A: On February 11, USS Spruance and USS Preble, without permission from the Chinese government, sailed into adjacent waters of Ren'ai Reef (also known as the Second Thomas Shoal) and Meiji Reef (also known as Mischief Reef) in China's Nansha Islands (also known as Spratly Islands). The Chinese Navy identified and verified the US warships according to the law, issued warning and expelled them. The trespass of US warships infringed on China's sovereignty and disrupted the peace, security and good order in relevant waters. China strongly deplores and firmly opposes such behaviors. China has indisputable sovereignty over Nansha Islands including Ren'ai Reef and Meiji Reef, and adjacent waters of the islands. China has all along respected and upheld the freedom of navigation and overflight in the South China Sea that countries are entitled to under international law. However, China is firmly opposed to actions that damage the sovereignty and security of littoral states under the pretext of "freedom of navigation and overflight". With the concerted efforts of China and ASEAN states, the situation in the South China Sea has been peaceful and stable and constantly improving. Under such circumstances, the deliberate attempt by the US to provoke trouble and create tension to disrupt the peace and stability of the South China Sea goes against people's common aspiration. 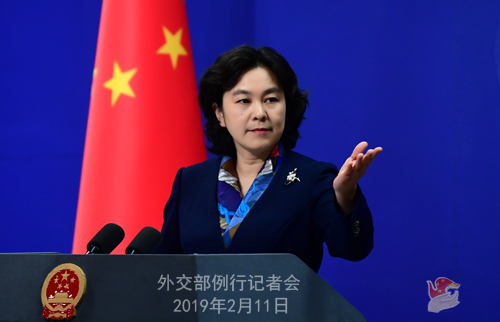 China urges the US to immediately stop such provocations and show its respect through concrete actions to regional countries' efforts to safeguard peace and stability in the South China Sea. 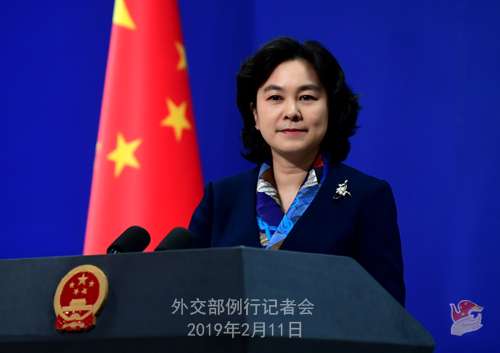 China will continue to take all necessary measures to resolutely defend its sovereignty and security and to maintain peace and stability in the South China Sea. Q: The US delegation led by Deputy US Trade Representative Jeffrey Gerrish has started talks with the Chinese side today. Can you tell us the main topics and schedule of this vice-ministerial consultation? What is China's expectation for the high-level trade talks on February 14 and 15? A: As for the China-US high-level trade talks, the Commerce Ministry has already released relevant information. Member of the Political Bureau of the Central Committee of the Communist Party of China (CPC), Vice Premier of the State Council and Chinese Initiator of the China-US Comprehensive Economic Dialogue Liu He will meet with US Trade Representative Robert Lighthizer and Treasury Secretary Steven Mnuchin in Beijing on February 14 and 15 for a new round of high-level trade talks. The two sides are expected to build on the consensus they reached in Washington and engage in more in-depth discussions on issues of common concern. As for the specific schedule, topics and expectations, I would refer you to the Commerce Ministry. Just like people in other countries, we hope that the trade talks could lead to a good outcome. Q: I have two questions. First, according to media reports, there are about 250 Chinese spies active in Brussels. I wonder if you have any comment on this? Second, there are reports claiming that President Xi might meet with President Trump in the near future. I wonder if you could confirm that? A: As to your first question, the relevant reports you mentioned are too ridiculous. The Chinese Mission to the EU and the Chinese Embassy in Belgium have both seriously refuted these reports at the earliest time possible. China respects other country's sovereignty and does not interfere in other country's domestic affairs. We have zero interest in the so-called practice of sending out a large number of spies to collect intelligence. What I would like to point out is that, beneath the noisy surface of the so-called "China threat theory" and "China espionage theory" lies the ruthless attempt by some in the US to coerce US allies into smearing and suppressing China. The US is pursuing a hegemonic and unjust course, and a few of its allies just follow wherever the US leads. Isn't it just pathetic? We hope relevant sides will adjust their attitude and view China's mutually beneficial relationship with other countries in an objective manner, and stop trying every means to slander and attack China. Such absurd allegations, when repeated, will only bring more damage to one's own image. I believe we all see this crystal clear. As to whether the presidents of China and the US will meet soon, we noted that President Trump expressed that he looked forward to meeting President Xi again. China is ready to stay in close contact with the US in various means. As to the meeting you mentioned, I have no information to provide. Q: The video you mentioned about Heyit was released on the Turkish website of China Radio International. An article on the website mentioned that this information is from the spokesperson of the government of Xinjiang Autonomous Region. But we didn't get any information from the spokesperson of the government of Xinjiang or the website of the government of Xinjiang Autonomous Region. Is the information from CRI correct? A: As a journalist with the Financial Times, you should have basic judgement. The Turkish Foreign Ministry spokesperson claimed that "Heyit died in the second year of imprisonment" while a video on February 10 showed him alive and well. Which is true and which is false? Do you still need me to answer this question? You might ask the Turkish Foreign Ministry spokesperson from what source he got the information that "Heyit is dead". Follow-up: I meant to ask if the report by CRI could represent the official position of the Xinjiang Autonomous Region. A: The report is a source of information with truth supported by evidence. You may pose your question to authorities in Xinjiang. I believe you will get the same answer. Meanwhile I also suggest that you ask the Turkish Foreign Ministry spokesperson for his source of Heyit's death. If the Turkish side really cares for his conditions, shouldn't they rejoice at the news that Heyit is still alive and enjoying good health? Lately many foreign media have brought up individual cases. To produce a responsible reply to your questions, we would contact relevant authorities in Xinjiang to make inquiries every time. However, our efforts only led to bewildering discoveries. For example, CNN asked about a Uygur woman named Mihrigul who claimed that her son died in a hospital in Urumqi and that she herself was in custody. However, as I clarified here, we found after verification that none of what she said was true. She was never held in any prison in Urumqi and her son did not die in a Urumqi hospital. So that was fake news. And yet Mihrigul was brought to a US Senate hearing. Then there was a letter from New York Times asking about someone named Baim urat who is now in Kazakhstan. He claimed that he used to be a policeman in Xinjiang and made accusations against the education and training centers in Xinjiang. However, after thorough verification with relevant departments in Xinjiang, we found that he never worked as a policeman, but only briefly as a security guard in a local market. In 2011, he secretly became a Kazakhstan citizen and was issued a Kazakhstan passport. But he withheld the information from public security authorities of China. He concealed his dual nationality. From July 2017 to June 2018, he worked as security guard at a market in Qitai County until dismissed by the employer for bad character. After that he went to Kazakhstan and fabricated a lot of rumors about Xinjiang. Most recently, the AFP and some other media agencies have been asking about the death of Heyit in prison as the Turkish Foreign Ministry spokesperson claimed. After verification with relevant departments in Xinjiang, we found out that Heyit is not dead. Yesterday, I also saw the video clip showing him in very good health. It is my hope that as journalists, you will prudently discern and cite your source and take your questions and coverage more seriously. If time and again you bring up fabricated cases with no truth in them, the credibility of your organization will be seriously doubted. Q: Given that claim that Abdurehim Heyit is alive and well, could you provide any information about the time of his detention, his whereabouts at the moment, or the reasons for his arrest? A: After thorough verification, relevant departments in Xinjiang provided the following feedback. Heyit, former actor in the Xinjiang Song and Sance troupe, is in custody for crimes against national security. The case is under investigation. If you want more details, you may place your inquiries with the authorities in Xinjiang. But I do hope that some of you will ask the Turkish Foreign Ministry for the source of Heyit's death in prison. Q: The second US-DPRK summit will be held in Hanoi, Vietnam on February 27 and 28. Does China have any comment on this? A: China has consistently supported the DPRK and the US in engaging in dialogue and consultation to find solutions. At present the two sides are preparing for the second summit. China supports and hopes for a smooth summit with positive outcomes, which will contribute to denuclearization and lasting peace on the Korean Peninsula. Q: On Saturday, an Air New Zealand flight was turned around en route to China, which claimed it was because it didn't have permission to land in China. As far as I know, the Chinese government hasn't provided any reason for this yet. I wonder if you have any information you can provide about the situation? A: I am afraid what you said is not true. Have you not heard? I saw some reports online. Due to temporary glitch in dispatchment, this airplane failed to obtain a landing permit with its destination and decided of its own accord to return en route. As to the specifics, you may ask China's civil aviation authority or Air New Zealand. Q: Just a follow-up question on Abdurehim Heyit. Will China release more videos of detained Uygurs to offer more transparency on the conditions and treatment? A: You may ask the Turkish Foreign Ministry to offer more transparency and make public its source. What information or evidence do they have to say that Heyit has died in prison? Q: Can I ask you to clarify what action the Chinese government is taking in response to the statement from the Turkish Foreign Ministry Spokesperson. Are you making any formal representations or demanding any kind of apology? A: I just said that the Chinese Embassy in Turkey strongly refuted the statement by the Turkish side at the earliest time possible, and the Chinese side has lodged stern representations with the Turkish side. We hope that the Turkish side could come around and realize their mistakes. Since their allegations are wrong, they should retract their false accusations. Like I already said, Turkey is also a multi-ethnic country facing the threats of terrorism. It has more reasons to understand and support the efforts made by a country's government to combat terrorism and maintain domestic security and stability. Q: You said that Heyit is still alive, but is the evidence for that based on a video you just mentioned or from an official source? A: Like I just said, after we received your questions, we contacted relevant departments in Xinjiang. They dutifully checked out the relevant situation and made a reply. Also, I saw Heyit's video yesterday. Q: Regarding the situation with Turkey, are you concerned that the comments by the Turkish Spokesman will do lasting damage to China-Turkey relations? A: As I said earlier, Turkey's statement was clearly a groundless accusation based on lies. China has made strong representations to the Turkish side. We hope they can recognize their mistakes and realize that their "accusations" on China were based on some absurd rumors. We also urge the Turkish side to correct and take back their wrong remarks, and uphold the mutual trust and cooperation between our two countries with concrete actions. I also want to point out here that some foreign media have brought about many similar individual cases recently. Some reporters raised such questions because they were deceived or eager to know the truth, not because they had ill intentions. Considering this, every time when asked such questions, we would contact the competent authorities in Xinjiang to verify relevant information and help you know the truth. We hope our efforts can help you know and report the current situation in Xinjiang in a more objective and just manner. We also hope that at the same time, you can think it over and introspect upon that after these reports on individual cases were proven to be lies time and again. Q: There is a Xinjiang businessman, Halemubieke Xiaheman, reportedly stuck in the Tashkent airport in Uzbekistan. I was wondering if you could confirm that China has issued an extraditional request for this businessman? A: You mentioned another individual case. I can give your question to the competent authorities in Xinjiang. But as I emphasized, the relevant authorities in China have spent a lot of time and energy to investigate the many individual cases you asked about, but they were always proven to be mere lies. I hope all media can be aware of that and keep vigilant. Next time when you raise a question, at least you should tell me your source and have your own judgment whether the information is true. I assume you all know the story about the boy who cried wolf. Once or twice is all right, but after three times, it tends to weaken trust. Q: Another question on Xinjiang. Thank you for verifying information for us, but now we have a problem. We cannot get any response from the spokespersons of relevant provincial, regional and munipal governments or their offices of foreign affairs when we contact them via fax or phone call. We want to directly ask the local authorities but do not have the access. Can you tell us what we can do? A: First, I'd like to thank you for your trust in the Ministry of Foreign Affairs. Here is something I think you need to know: the Information Department of the Ministry of Foreign Affairs is not in charge of the spokeperson's office of the government of Xinjiang Autonomous Region or any branch of the State Council. It is the State Council Information Office that you need to raise this question to. My advice is that you really think about how people interact with one another. 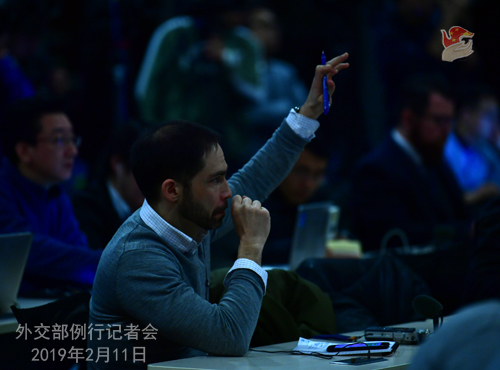 We attach importance to foreign reporters' questions and do our best to help you know the truth. But after careful verification, all individual cases are proven to be lies that smear China's image. It will only make people who helped you become antipathetic, defensive and alert; they do not want to communicate with you any more. But if you demonstrate your readiness by making objective and fair reports, I believe they will be more willing to conduct open and candid communication with you. This is how interpersonal relations work, and it is the same with working relations. So I hope you and all our friends from foreign media here can earnestly think about it: what will be your response if your colleagues' comments on you are all lies and rumors intended to damage your reputation? Do you still want to talk to them? The answer is obvious. I hope you can earn the trust of people in Xinjiang and their readiness to contact you by taking more real actions. Q: The vice-ministerial trade talks between China and the US has already begun. Will the US "freedom of navigation" operations affect bilateral consultations? I got a sense of déjà vu because in the past whenever China and the US held trade talks, the US side would stage "freedom of navigation" operations. What is your comment? A: You are a very acute observer as you have found out their pattern of "maneuvers". In fact, you all know clearly what is on the mind of the US side. Regarding China-US trade talks, I have made clear China's position. You need to ask the Commerce Ministry for the specific details. When China and the US resolve trade frictions through dialogue and consultation, the interests of the two sides, the common aspiration of the international community and the world economic growth stand to benefit. We are ready to have talks with the US side in the spirit of equality, mutual respect, mutual benefit and win-win results. As for the so-called "freedom of navigation" operations taken by the US side, China respects and safeguards the genuine freedom of navigation and overflight that all countries are entitled to in accordance with international law. However, we firmly oppose using "navigation freedom" as a pretext to undermine the sovereignty and security of coastal states. This position is firm, clear and consistent. Q: First, Australia last week revoked the visa of a Chinese businessman and political donor Huang Xiangmo. I would like to know China's comment on this. Second, Venezuelan opposition Juan Guaido has said that he is willing to engage Chinese officials in dialogue as soon as possible and will honor bilateral agreements. Has China already begun discussions with Guaido on Venezuela's debt repayment? A: On your first question, I have no relevant information. But one thing is clear: the Chinese side never interferes in others' internal affairs. This position has been reiterated multiple times. We hope that the Australian side could handle the relevant issues involving this Chinese citizen in a fair, just and non-discriminatory way. As for the situation in Venezuela, we hope that the Venezuelan people could sort out their own matters and resolve the issue through peace dialogues and political means under the legal framework in accordance with their Constitution. Only in this way can Venezuela realize enduring stability and order in the real sense. 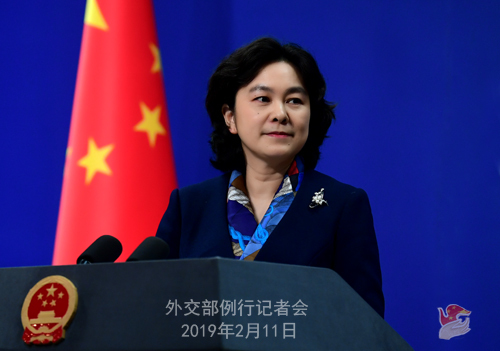 China supports the efforts made by the international community to achieve this end and hopes that all parties could contribute constructively to the peaceful settlement of the Venezuelan issue. The relationship between China and Venezuela is a normal one between two states. Our two sides have been conducting practical cooperation for a long time following the principle of equality, mutual benefit, common development and commercial rules. Such cooperation complies with laws and regulations and has benefited the two countries and peoples, and therefore should stand beyond any harm no matter how the situation on the ground may change. China will continue to advance its exchanges and cooperation with Venezuela in various fields in accordance with the principle of equality, mutual benefit, win-win cooperation and common development. 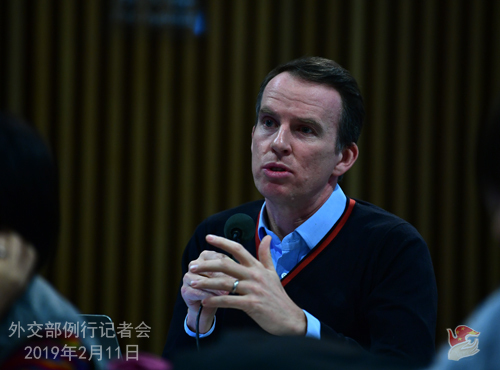 Q: There are some reports that talk about 17 Australian residents who are being detained in Xinjiang. Can you confirm this information? A: I haven't heard of that and have no relevant information. It would be better if you provide specific names and their information so that we can help you check out the situation.